The BEST STICKING Hip Numbers on the Market!! 3.5 " numbers on Sticky Back paper. Flexible and stick to ALL uniforms & bodies. 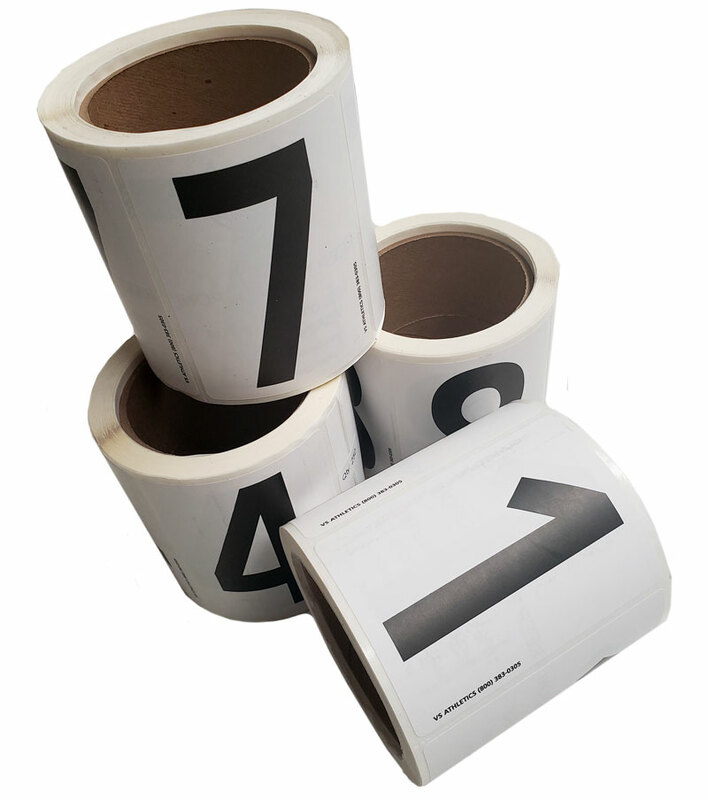 Sets of 25(in a pack), 100 (4 packs) or 250 (on a roll) of each number. If you want rolls, order 250 sets only. Identify athletes faster. See Photo for Style numbers. Do not choose a size if you are ordering a set. That is for individual #'s only. Do not choose a size if you are ordering a set. The size is only for individual # selections. How many do you need? In a worst case scenario, a good timer using a photo based timing system can tell which runners are where in laned races (races that finish in lanes, i.e. 400m or less) by looking at his photo so you would only need numbers for distance races (800m and up). However, its nice to have them on ALL races. Most HS dual meets can get by with sets of 100. Any meet with over 6 schools should order rolls of 250. The numbers worked great. They were easy to read and stayed in place. Our Track And Field Association needed hip nubers in a super crunch and we got them on time beacause VS Rocks! Very Happy! Great prices dependable people. 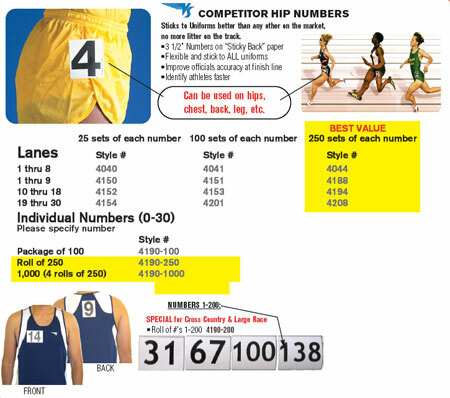 I have used the Hip Numbers 1-200 for the past ten years. As a football coach, I use the numbers for showcases and challenges. They have been an incredible tool to identify players.